Located in the Caribbean, just north of Venezuela, El Guamache serves as a port to the Isla de Margarita (Margarita Island). Originally lured to the island by the giant pearls off its coast, tourists now visit Margarita Island to enjoy its gorgeous beaches, friendly culture and exotic goods. At the port there is a small booth with tour operators and information, as well as some vendors selling souvenirs. Cruise passengers can rent jet skis at the port, as well as paddle boats and banana boats. There are no attractions within walking distance of the port and a car or taxi will need to be rented to explore the island. Drinks and snacks are available from a number of bars. From El Guamache, the nearest town is Porlamar. 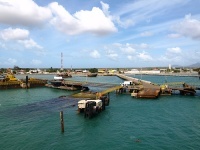 There are taxis available from the port, and a few tour operators offer tours to the island's main attractions. There are some great beaches to visit in the areas round Porlamar, particularly Playa El Agua. After relaxing on the beach, shopping is the prime attraction of Margarita Island. At the port, La Punta Commercial Boulevard has an array of exotic souvenirs and tasty foods on offer to passengers. Nearby, Porlamar's famous avenues of Santiago Mariño and 4 de Mayo offer fine colonial architecture and elegant shops. Shopping is a very popular activity in Porlamar. La Punta Boulevard, at the port, is a long promenade with vendors offering an array of local crafts and souvenirs, including hand-painted pottery, pearl and shell jewellery, woven baskets and stone figurines. The Santiago Mariño and 4 de Mayo avenues in Porlamar have top-end boutiques, while the Sambil Margarita shopping mall has a variety of trendy retail outlets.